After World War Two the Saar was occupied by French troops. By the Saar Constitution from 15th December 1947 a new flag was created, and by Law from 14th December 1948 new Arms. The arms are obviously derived from the flag. The flag showed some kind of Scandinavian cross: a white cross divided the colours blue (at hoist) and red (at fly). The Arms showed the same design, but in a vertical arrangement, i.e. a shield divided by a silver cross, the upper part blue [chief Azure], the lower part red [base Gules]. The crest above the shield was a red bridge with four pillars and three arches, underlining the connecting function of the Saar between France and Germany. The colours and even their arrangement derived from the French tricolour. After the decision of the Saar people to join the Federal Republic of Germany with effect 1st January 1957 the Saar parliament resolved new symbols on 9th July 1956, the present ones. The new flag retook intentionally the German colours black-red-golden, defaced by the new Arms in the centre. Source: Lehne and Kohler 1981. It must be said that this flag was never popular in the Saarland. Only the government, parliament and other state departments used it. The flag was also used in major international sport events, especially the Olympic Games of Helsinki in 1952. People favouring a return of the Saar to Germany used the German flag. A white Scandinavian cross with hoist fields blue and fly fields red. In use 16 June 1948 to 1 January 1957. Illustrated in Kannik 1957 no. 196. Ratio 2:3. The reason of the Scandinavian cross is unclear, but the Saar was ruled first by politicians belonging to a Christian party. This is just an hypothesis. Schurdel 1995, p. 177, refers to this flag as a "a shield image projected onto a flag cloth" (Die Flagge des Territoriums war das auf ein Fahnentuch projizierte Schildbild), which should be a banner-of-arms. This is however not really true, since the arms had a small bordure argent (no picture of the flag is shown in this book), a bordure which does not seam to appear on the flag and the blue fields were on the top, not on the dexter [left] of the arms. The colours are said to be the same as in the flag of France. The flag is shown in Kannik 1957, p. 32, but the text (p. 167) only states that it was adopted after World War Two (and gives a description of the flag used earlier). The flag shown clearly has a white scandinavian cross, blue fields at the hoist and red fields at the fly. Its proportions are stated to be 2:3. I recently attended the Weltexpo in Hanover, Germany. In the German pavillion, there was a hall which contained exhibits from each of the 16 Länder of the Federal Republic. The Saar chose an exhibit that commemorated the treaty between France and Germany that allowed the French protectorate of Saar to join the Federal Republic of Germany in 1957. 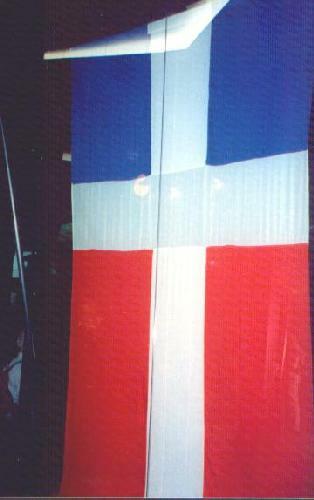 As part of the exhibit there was a case containing the pre-1957 flag of Saar, hanging vertically as shown in this picture. No mention or depiction of any other symbols. Vexillacta no. 12, June 2001, includes a short note on p. 20 about the flag used by Saar between 1947 and 1957, signed by Pascal Vagnat, containing more or less the same information as the second paragraph above. The note adds that the German authorities were so upset by the Saar flag that they nicknamed it der Saarlappen, lit. 'the Saar dustcloth'. Anyway, this flag was used by the Saar athlets in the Helsinki Olympics (1952), who marched before the Germans  Germany being Saksa in Finnish. According to Article 60 of the constitution of the Saarland, the Diet has passed the following decree, which will be published herewith. The flag of the Saarland consists of a rectangle, in which the breadth is to the length in the proportion of 1:1.618 (after the golden section, German Schnitt). It is light cobalt blue, and is divided into a middle-red quarter-field, in the proportion of 1:1.618. Over the length and breadth of the flag, running from edge to edge is a white cross, of which the length-beam is in the centre of the flag, and whose crossbeam in the blue field runs to the limit of the field. The size of the lengthbeam in proportion to that of the smaller part (which is after the golden section) divides the breadth of the flag into 1:1.618. The size of the crossbeam in relation to that of the lengthbeam is 1:1.618. The measurements are shown in sketch 1, and the colours may be seen in sketch 2. According to Article 61 of the constitution of the Saarland, the Landtag has passed the following law, which will be promulgated herewith. The flag of the Saarland consists of a rectangle, in which the breadth is to the length in the proportion of 1:1,5. It is divided in two vertical fields light cobalt blue and middle cinnabar red [German: mittelzinnoberrot, French: rouge de cinabre moyen], also in the proportion of 1 to 1,5. The flag has a white cross, which length beam in the middle of the flag and its cross beam on the line of separation between the blue and red fields  which is also the middle line of the crossbeam  are running from edge to edge. The width of the cross beam and the width of the lengthbeam are equal. The width is equal to one fifth of the width of the flag. There are some differences between the texts I have and the text of H. Gresham Carr, quoted by Dave Martucci. The proportions are not the same, the width of the cross is not mentioned in the Dave Martucci's text, the crossbeams run in both fields and not only in the blue one. There aren't any sketches in the projects of law, but one is in the law, depicting the flag in a vertical position (to show obviously the cross) and in black and white. The flag of the Gouverneur de la Sarre, Gilbert Grandval was the same as the flag of the territory though in triangular shape (20cm x 28 cm) with a thinner cross than in the normal flag and the coat of arms in the middle on a golden shield. Land high authorities' flag 1947-1955: Saarland flag, 25 × 35.5 [cm] with the arms bordered golden in center of the cross. Source: Roger Harmignies, article in Vexilla Belgica, issue 11, 1987. There were also flags for the minister, and for the ambassador in France, but I don't know the details. A silver border appeared on some and some were also triangular. Source: personal and legal archives, with legislation and official documents from the German Länder, as well as the informations of Jürgen Rimann, the best German specialist for all the car flags in the world and a very reliable source. A white Greek cross with upper half of field red and lower half blue. In use 17 December 1947 to 16 June 1948. Existence of this flag is doubtful. According to the above text the flag should be red over blue with a white cross on the whole. I don't think this flag really existed. It might be possible when the flag was in fact a banner, that is a hanging flag, with proportions 2:1 or 3:1. But in that case, blue would be on top and red below. I think the image above by Santiago Dotor is correct blue hoist and red fly with a normal cross over all and that that flag may have have really existed before the official one was adopted. My hypothesis is that the flag was the emblem of the Mouvement pour le rattachement de la Sarre (Movement for the annexation of the Saar  to France) and since many politicians in the Saar were members of that movement after the war, that emblem was adopted as the emblem of the Saar country.